One day when I was getting my master's at San Francisco State, I had a terrible cold but couldn't take the day off. 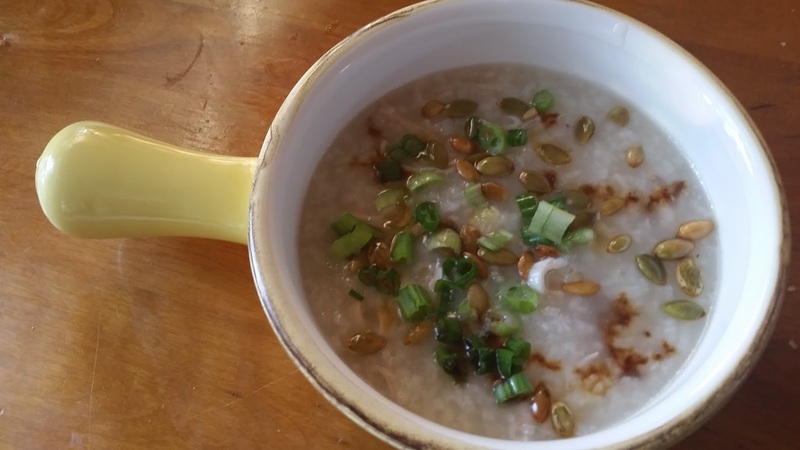 I wandered into the student union in search of breakfast and discovered the magical concoction known as Congee (or Rice Porridge, or Jook in Cantonese, or Zhou in Mandarin). I've since made it several times on the stovetop. When I first got my magical Instant Pot, I was really excited to see the porridge function. I played around a bit to test it, just using rice and water. The first batch tasted great but didn't have the right look to me or to my Chinese-American colleagues. 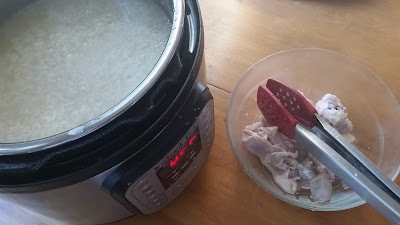 I found a tip from a Hong-Kong based Instant Pot user who said he put the uncooked rice in the freezer for an hour first, and the second test batch using that technique passed the visual test in the teachers' lounge. I got wrapped up in other recipes and put the testing aside for a while. Then, I came down with a cold. Grrr. I've been pretty healthy this year, so I suppose I shouldn't complain. But wahhh! 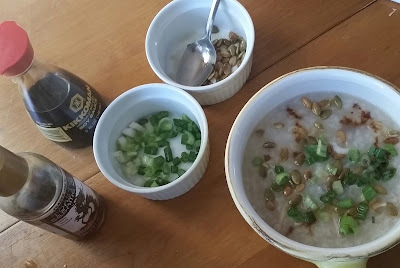 I've posted another recipe for congee that's pretty similar for the stovetop, but I decided to try it out in the Instant Pot because it won't burn the place down if I fall asleep while it's doing its thing. It switches over to a keep warm function when it's done, and that will keep going for hours if need be without burning the bottom of the pot. 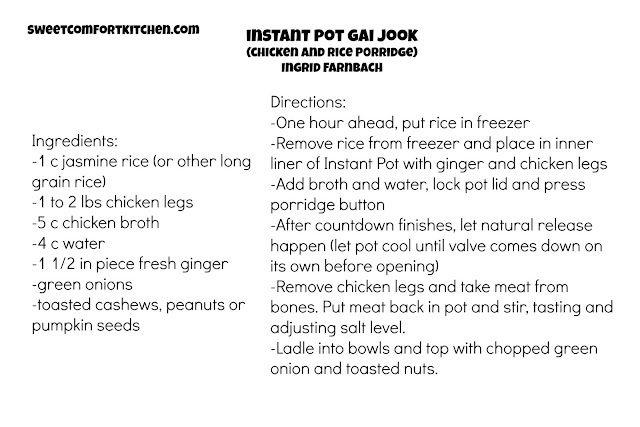 An hour or more before you start, put 1 c uncooked jasmine rice in a small container in the freezer. If you like a thicker congee, use 1 1/2 cups. Remove it from the freezer and add it to the liner of the Instant Pot. Add a 1 to 2 inch piece of fresh ginger. 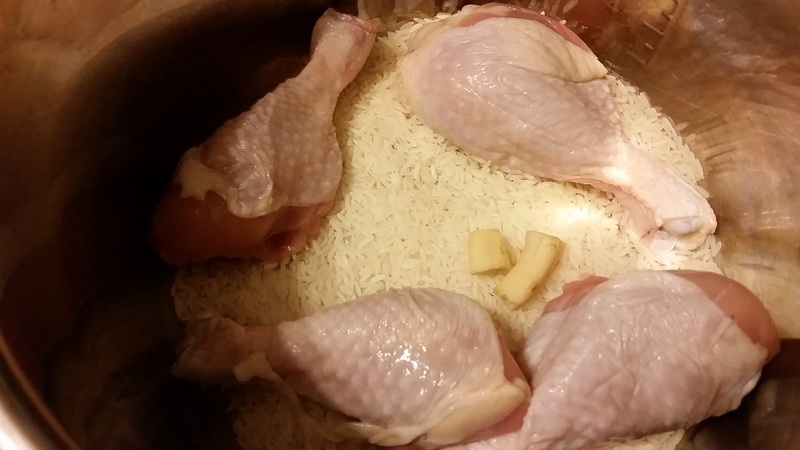 If you're using just water, add 2 pounds of chicken legs. If you're using broth and water, 1 pound can be enough flavor-wise. Cover with 9 cups liquid: 5 cups low-sodium chicken broth and 4 cups of water is great, or 8 cups of water is fine. Make sure the liquid is below the MAX line on the inside of the pot and remove a little if you need to. I like the Cantonese style congee that's on the thinner side. If you like it thicker, use 6 or 7 cups liquid. Now, lock the lid on the pot and press the "porridge" button. 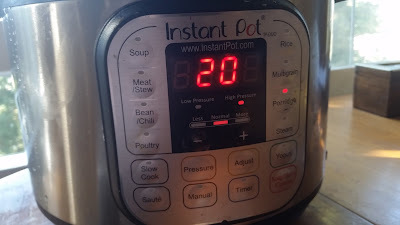 If the liquid is cool, it might take up to 25 or 30 minutes to come up to pressure and start counting down, so that's more like 45-50 minutes of cooking time. When it beeps, let it do the natural release thing and don't open until the valve goes down. If you can't wait, give it at least 15 min NPR before releasing the rest of the steam. 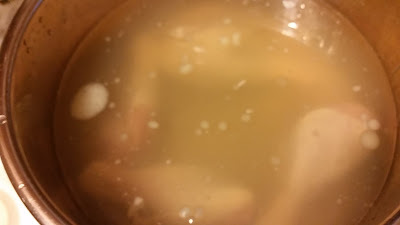 Remove chicken legs from pot. Let cool long enough to remove the meat from the bones. Return the meat to the pot and give it a good stir. Check for salt - you might want to stir in a teaspoon or so if you used only water. Ladle into bowls and top with 1/2 a chopped green onion per bowl and some toasted peanuts, cashews or pumpkin seeds. I forgot what I'd bought the peanuts for and ate them. Oops! Pumpkin seeds tasted great, though! Drizzle on a little soy sauce and toasted sesame oil. Tried this in my new Instant Pot. Yummy, fast and easy! Can I make this with brown rice? Would I need to change the amount of liquid? Time? Glad you liked it! You'd definitely need to increase the time, probably by doubling it. It won't break down the same way, but it'll have all those added nutrients. No need to add more liquid under pressure.